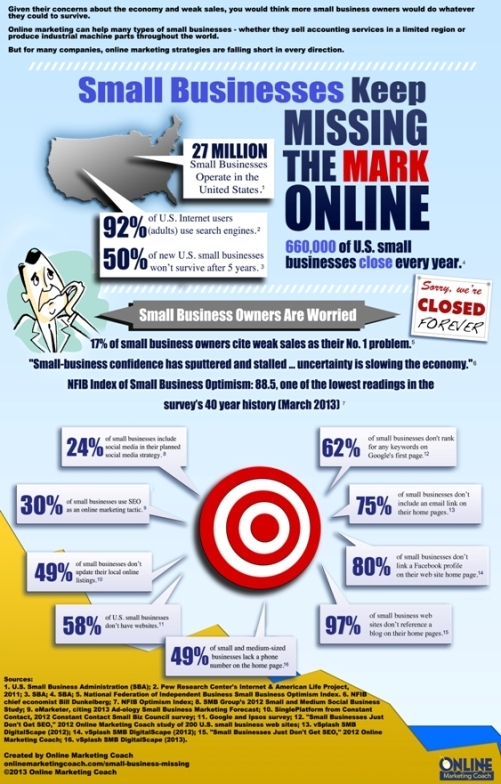 Our FREE infographic summarizes the state of small businesses and online marketing. Given their concerns about the economy and weak sales, you would think more small business owners would do whatever they could to survive. Online marketing can help many types of small businesses - whether they sell accounting services in a limited region or produce industrial machine parts throughout the world. But for many companies, online marketing strategies are falling short in every direction. Infographic: How Small Businesses Miss the Mark with Online Marketing. How Small Businesses Miss the Mark with Online Marketing. Sources: 1. U.S. Small Business Administration (SBA); 2. Pew Research Center's Internet & American Life Project, 2011; 3. SBA; 4. SBA; 5. National Federation of Independent Business Small Business Optimism Index. 6. NFIB chief economist Bill Dunkelberg; 7. NFIB Optimism Index; 8. SMB Group’s 2012 Small and Medium Social Business Study; 9. eMarketer, citing 2013 Ad-ology Small Business Marketing Forecast; 10. SinglePlatform from Constant Contact, 2012 Constant Contact Small Biz Council survey; 11. Google and Ipsos survey; 12. 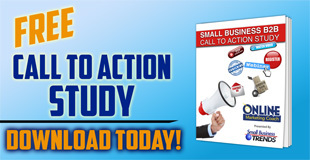 "Small Businesses Just Don't Get SEO," 2012 Online Marketing Coach study of 200 U.S. small business web sites; 13. vSplash SMB DigitalScape (2012); 14. vSplash SMB DigitalScape (2012); 15. 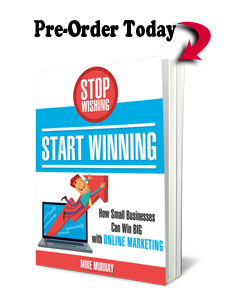 "Small Businesses Just Don't Get SEO," 2012 Online Marketing Coach; 16. vSplash SMB DigitalScape (2013).